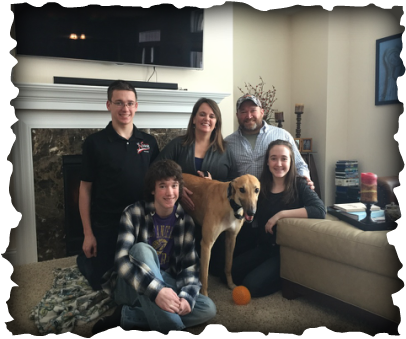 Power is now in his forever home in Union Kentucky with Deanna, Mike, Noah, Liam, and Kiersten. Power was a bit unsure about all this snow on the ground but walked right in to their home and immediately started giving kisses to everyone- he felt very confident and happy, clearly. They had done lots on research on the breed and were experienced dog owners and had everything ready to go for their new family member- lots of cozy blankets, tons of toys, and dog beds. Power will be the center of attention (and be getting lots of it) with his new family. They hope to add to it soon!